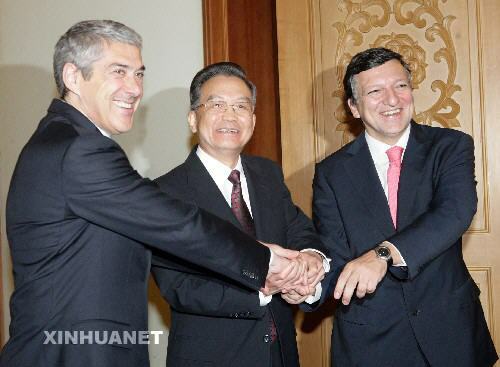 On November 28, 2007, during the tenth meeting between Chinese and European leaders, Premier Wen Jiabao of the State Council met with Prime Minister Jose Socrates of Portugal, which currently holds the rotating EU presidency, and European Commission President Jose Manuela Barroso at the Great Hall of the People. Both sides reviewed the development of China-EU relations in the past ten years, summed up experiences and outlined the plan for the future development of bilateral ties. The leaders all agreed to make concerted efforts to move the comprehensive strategic partners between China and EU forward. Wen said that in the past decade, China-EU relations witnessed the fastest development ever in history and remarkable achievements in mutually beneficial cooperation. China-EU relations reached an unprecedented level both in terms of width and depth. The two sides went through an extraordinary path from constructive partnership to comprehensive strategic partnership and achieved leapfrogging development in bilateral ties. The dialogue and consultation mechanisms are improving and mutual trusts are increasing. The connotation of strategic partnership is being constantly enriched. The focus of attention is moving from bilateral to regional and multilateral areas. Economic and trade relations are getting increasingly close. The two sides have become each other's most important trading partner. The multi-faceted and multi-level exchange and cooperation in a wide range of areas are moving forward at a fast speed. The social and public foundation for China-EU relations is getting increasingly consolidated. Wen pointed out that the main experience summed up from the development of China-EU relations in the past decade is as follows: both sides attached great importance to China-EU relations and looked at and developed such relationship from a strategic and long-term perspective all the time; both sides supported the development of each other and viewed such development as opportunities rather than threats; both sides established and improved a set of dialogue and consultation mechanisms, creating sufficient conditions for expansion and consolidation of cooperation; both sides cared about each other's concerns and reached consensus on resolving disputes through equal dialogues and friendly consultations. Wen stressed that China-EU relations are at a new and important stage of development. Multi-polarization and globalization bring more opportunities than challenges to China-EU relations. We would like work together with EU to seize opportunities and upgrade the comprehensive strategic partnership to a higher level. Wen raised the following proposals on the development of China-EU relations: firstly, maintaining high-level exchanges, making full use of the existing mechanisms and exchanging views on bilateral and global issues in a timely manner; secondly, optimizing trade structure, expanding trade scale, and properly handling the problems in bilateral trade. China will continue to expand market access in accordance with the commonly adopted international economic and trade rules; thirdly, accelerating the negotiations on promoting China-EU partners cooperation accord; fourthly, developing common plan for scientific and technological cooperation and signing educational exchange cooperation accord as early as possible, and implementing cultural dialogue and cooperation work plan; fifthly, strengthening pragmatic cooperation in climate change, energy and environmental protection. Socrates expressed that the development of EU-China relations in the past decade was pleasing. The EU-China strategic partnership benefits Europe, China and the world as well. China is a global partner of EU. EU appreciated the role played by China in addressing such major international and regional issues as the nuclear issue on the Korean Peninsula and the Iranian nuclear issue. The cooperation between EU and China is conducive to resolving global issues and will make the world more peaceful and secure. The economic relations between China and EU were very successful. EU hoped that the two sides could seek trade balance in a more active and constructive manner. EU is committed to developing EU-China strategic partnership and upgrading EU-China relations to a new level. Barroso said that EU-China relations are getting increasingly closer. The scale and scope of cooperation between EU and China in various areas such as politics, economy, education and tourism were unprecedented in the history of China-Europe relations. The economic relations between EU and China were getting more and more interdependent. EU hopes to inject new vitalities to EU-China dialogue mechanism and work together with China to resolve the concerns of each other. The EU side expressed that EU adheres to the one-China policy. The Taiwan authorities' plan for a referendum for UN membership is a dangerous move to unilaterally change the status quo across the Taiwan Strait, which EU was critical of and would not support. After the meeting, the leaders attended the contract signing ceremony. Later, the leaders met with the journalists. Wen said that a strong Europe benefits the peace and stability of the world. China places the development of relationship with EU in a very important position in our external relations. Socrates stressed again EU's adherence to the One-China policy. The Taiwan authorities' plan for a referendum for UN membership is a negative move. Dai Bingguo, Vice Foreign Minister and Head of the international Liaison Office of the CPC Central Committee, was also present at the above-mentioned activities.